What’s the difference between a Carpenter and a Potter? That’s roughly the difference between Mahalo and Wikipedia. Not precisely, but roughly. Carpenter works with tools. Potter works with hands. Carpenter cuts the wood in pieces, gives them shape by applying a lot of force, then puts these pieces in some order back again. Potter spins a wheel which is the main supplier of further force and then just sits and gives shape. 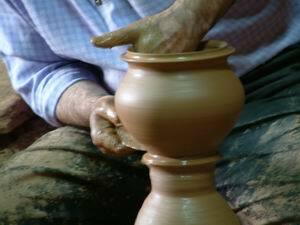 The wheel keeps spinning and the potter keeps giving shape. Carpenter exercises explicit control over the entire process while Potter exercises very subtle control. Building Mahalo is Carpentry where it is decided which articles to write, the format in which to write, assign people to write them, review them, put them up, keep people on job for updating them. Building Wikipedia is Pottery where the core Wikipedia team primarily works towards keeping things in shape and maintaining some quality. Rest is all done by the spinning wheel (i.e. a movement towards building a free encyclopedia). Both are art and both have their own pluses and minuses. They both can give good results. You need to decide which approach will work for your site and then stick to that. What’s your opinion? Do you agree with this observation?